Young and Tae announced the opening of their first-ever brick and mortar store, located in Toronto. The upscale retail brand will be selling its shoe and accessory line, designed and manufactured in Seoul, South Korea. Located at 630A Queen St. W., the store opened its doors to the public since Wednesday, December 11. The line is also available across Canada at: www.youngandtae.com. Owners Jenny and David Kim created Young and Tae as a tribute to Jenny’s parents, who have been in the business of manufacturing and wholesaling women’s shoes in South Korea for more than 35 years. The brand marries the accessible prices points of direct distribution, with the fashion-forward styles typical of the Asian and European markets. Young and Tae will inject quality, value and style into Toronto’s retail landscape, just in time for the holiday season. The 1,800 square foot store was conceptualized by architect Bennet Lo, principal at notable design firm Dialogue 38. The space embodies a fresh, modern aesthetic, using natural materials to showcase the handcrafted shoes. 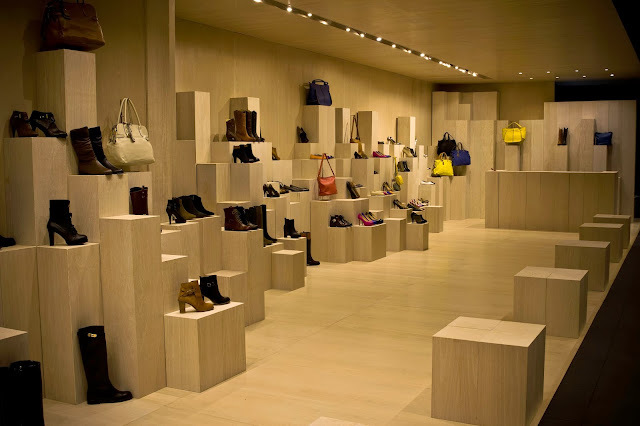 The clean look is achieved by using oak plywood panels to create a natural feel throughout the store. Modular display podiums create a gentle curve through various heights and placements throughout the space.